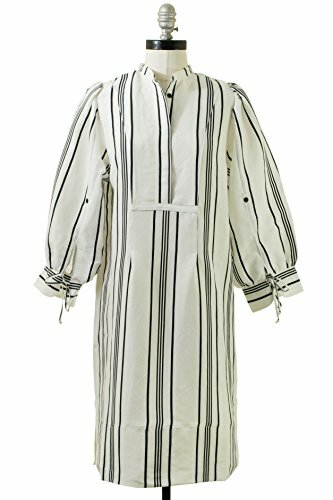 Apiece Apart Isli Viola Shirtdress Sandalwood Stripe. Collarless knee length shirtdress featuring hidden button bib and puff shoulder balloon sleeves that tie at the wrist. The wide hem has has a slit on either side. If you have any questions about this product by Apiece Apart, contact us by completing and submitting the form below. If you are looking for a specif part number, please include it with your message.